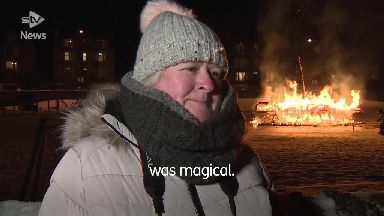 Thousands once again gathered for the annual fire festival on the streets of Lerwick. 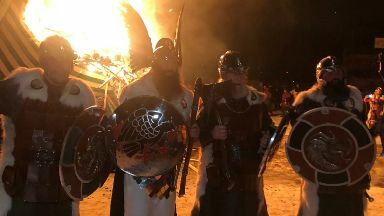 Up Helly Aa 2019 got off to a snowy start, as Shetland woke to a blanket of white, but that did little to dampen the spirits of locals, tourists or this year's Jarl Squad. The annual fire festival - always held on the final Tuesday of January - celebrates the island's Nordic links and the middle of winter. 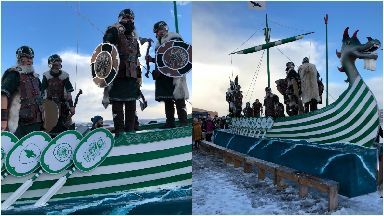 It kicks off in spectacular style, with the Jarl Squad and Junior Jarl Squad winding their way through the streets of Lerwick, cheered on by thousands of people who lined up to bear witness. One of the highlights of the morning is the unveiling of the galley boat - something the Jarl Squad spent months preparing and which this year was particularly special to the Guizer Jarl, played by John Morrison. Painted with green and white hoops, he told us it was down to his love of Celtic FC and that those who knew him would have expected nothing less. It was also a momentous morning for John as he became the fourth member of his family to be honoured with the role of Guizer Jarl, following in the footsteps of his brothers and father before him. The whole event is stepped in history, with the celebrations dating back to the late 1800s, and though they have evolved over the years, the traditions remain, with the fire festival at the head of proceedings. Tourists come from all over the world to witness the torchlight procession, which sees the Guizer Jarl lead thousands of men in costumes carrying flames down darkened streets. It is a breathtaking sight to behold as they sing traditional Up Helly Aa songs and light up the Shetland sky. The climax sees the galley boat led into a park and surrounded in a circle before being set alight with torches to cheers and roars from the crowd. After all the work that goes into making the boat - the Jarl Squad build this as well as making their own viking costumes, which cost thousands of pounds - you would think it would be with mixed emotions that they watch their efforts reduced to ashes, but John explains it's simply a moment of pride and a highlight of an incredible day. A long day of ceremony and rituals doesn't end there. For many, this is when the real party begins. Celebrations were held throughout the halls of Lerwick, with the ferry terminal even converted into a venue for young and old to come together and celebrate Up Helly Aa. And party they do. Squads of men, dressed in fancy dress, go round each of the venues showcasing a short sketch or dance they have been learning throughout the year - each unique in their own way. The Jarl Squad's turn this year involved a rousing rendition of James classic Sit Down - difficult to do in those outfits. These parties carry on into the wee small hours, with many going straight from the venues at 8am to enjoy a slap-up breakfast in the town, making the most of the the day's holiday islanders are given and perhaps lining their stomachs as they get ready to celebrate all over again, with another dance tonight - the Hop! Up Helly Aa is a true spectacular and one to be added to the bucket list. A festival that will literally warm your heart.